Visit Wild Toad Nursery for more information about designing water features for wildlife. There is no more important time to install a water feature than during a drought. Animals and insects need fresh water to drink, and many species reproduce only in water. And the food web! 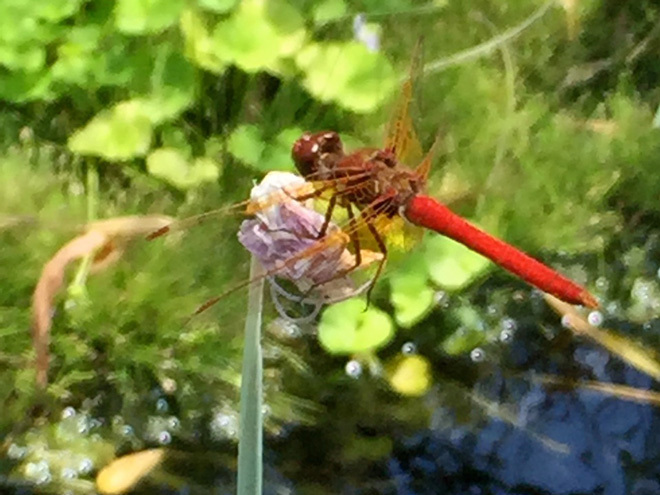 Less water for dragonflies, whirligigs, Jesus bugs, chorus frogs, and salamanders to reproduce in, means less food for bats, songbirds, and garter snakes. And fewer of those creatures, means less food for the raptor, fox, and cougar. You know how it works. Providing even a small backyard water feature can make the difference between surviving or not for wildlife, even for species that never visit your yard. There are many different kinds of water features. I find small ponds offer a greater bang for the buck, where the “buck” is my time and the “bang” is the amount of wildlife I get to support and enjoy. I live in a high-density neighborhood. My small pond is six feet in diameter and brings in chorus frogs, songbirds, and dragonflies so it feels like I live in a country cottage. A well-designed backyard pond requires less water than a lawn or traditional landscaping, and is quite low-maintenance. The goal is to create a balanced ecological environment that mimics nature. Whether you decide on an in-ground pond or an above-ground water feature, the following three factors will reduce maintenance, maximize your enjoyment, and create a wildlife-friendly environment. Warm water encourages fast-growing algae, which is unsightly and indicates a system out of balance. 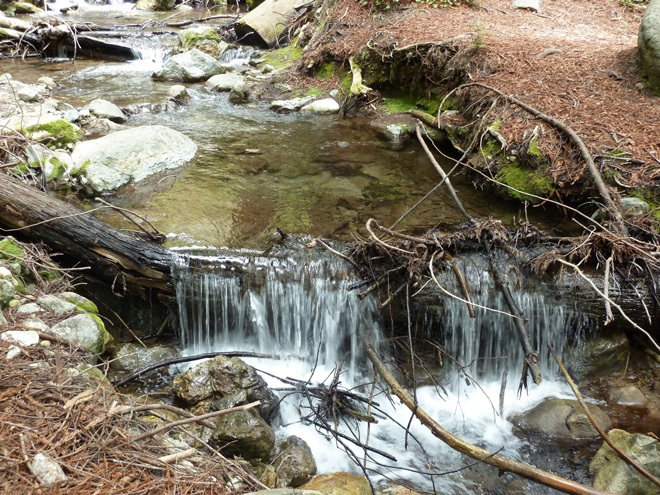 Shallow water warms more quickly while deep water retains pockets where the water stays cool. If you have an aboveground pond that is less than 18 inches deep, place it where it will get afternoon shade. In-ground ponds should have some portions that are at least 18 inches deep—preferably 24 to 36 inches. 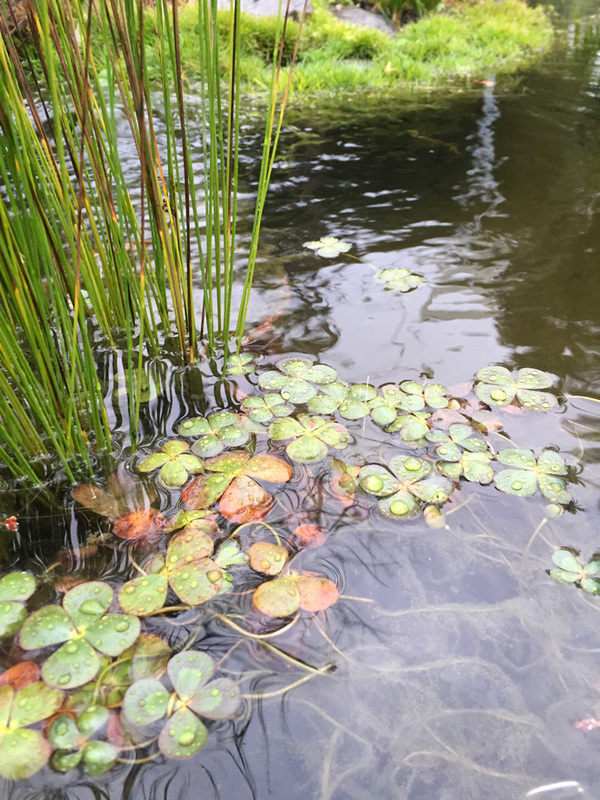 Plants are very important for a healthy pond environment; make sure two-thirds of the surface of the water is covered in plant material. Plants create shade, cool the water, clean the water, and provide food and nesting sites. A pump that keeps the entire surface of the water active controls mosquitoes, as they do not lay eggs in moving water. Mosquito fish (Gambusia affinis) are are also effective, no maintenance, and available free from some county vector control agencies. However, mosquito fish eat frog and dragonfly larvae, and many other insects. Because many California ponds are seasonal, native wildlife species have not evolved defenses against fish. I have found Gambusia and goldfish to be destructive to habitat ponds. Bacillus thuringiensis israelensis (BTi) is a naturally occurring bacterium that only kills mosquitoes and black fly larvae. Marketed under the name Mosquito Dunks, this certified organic product has been around since 1979 and has proven to be very effective and safe. I don’t use organic snail bait in my yard, but I do use Dunks. Mammals, insects, birds, and even humans need a shallow approach to get in and, most importantly, out of the water. If possible, create a shallow, beach-like access to the water. Butterflies love to uncurl their long proboscises and gently tap the beach to gather moisture from between grains of sand. Alternatively, water plants provide a way for animals to escape the water, whether they fall in accidentally or as they morph from water creature to land dweller. A small log resting on shore and in the water will also work. Look to natural ponds for your model. During these days of drought, we do not need to feel a water feature in our garden is out of place ethically or aesthetically. 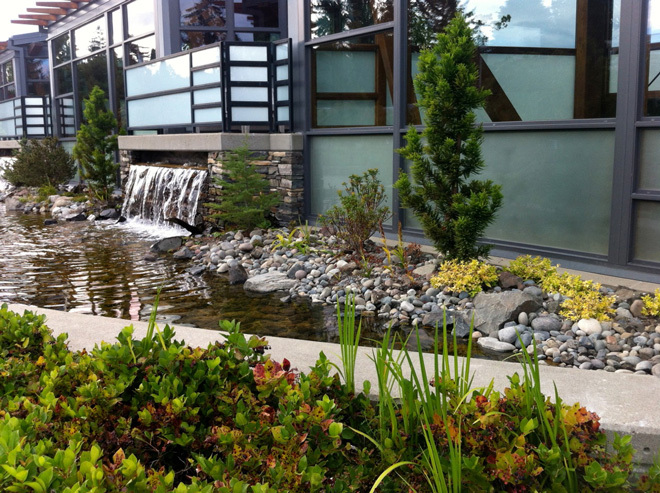 There are many innovative designs that blend well into new, water-conscious landscapes. A well-designed, small water feature adds musical sound, reflection, and a lush allure for humans while providing a necessary resource to the web of wildlife.